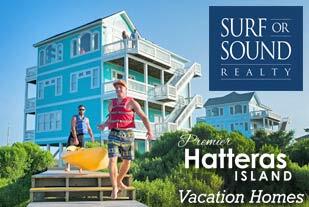 Surf or Sound offers weekly vacation rentals of premier vacation rental homes from single family beach cottages to expansive oceanfront estates with a wide range of luxury amenities. 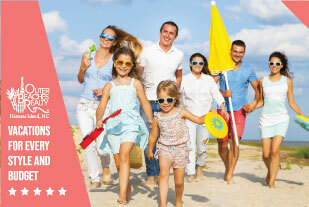 We serve thousands of happy Outer Banks vacationers every year and look forward to seeing you at the beach this year! Visit http://www.surforsound.com or call 866-628-0368 for more information. 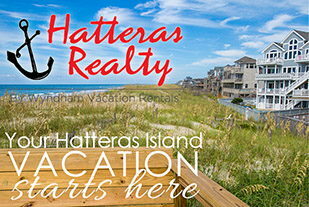 Hatteras Realty has a large selection of Hatteras Island rental homes perched in the best locations. Find the right vacation home that fits your budget. Cast your sights on over 70 miles of pristine Cape Hatteras National Seashore. 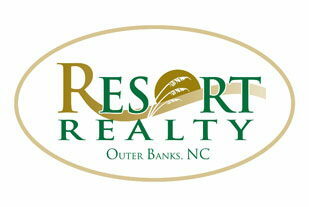 Hatteras Island is a one of a kind place and Hatteras Realty is a one of a kind Outer Banks vacation rental company. 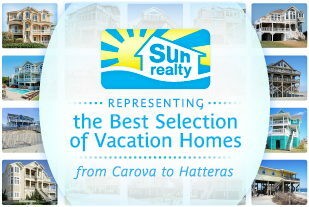 Visit www.hatterasrealty.com today or call 800-428-8372. Outer Beaches Realty: Spend less time planning and more time vacationing when you stay with Outer Beaches Realty. With nearly 450 homes we have options to fit every style and budget. Guests love our all-inclusive pricing with NO booking fees, LayAway Vacations, E-Z Pay options and more, so much so they’ve rated us higher than all other vacation rental companies on the Island on Yelp, Google, and Facebook! Buxton, though its name might not spark recognition among newcomers, may easily be one of the most distinguishable beach destinations on the Outer Banks. Home to the nationally-recognized Cape Hatteras Lighthouse and world-famous fishing beach "The Point," visitors who stay in a Buxton vacation rental will have easy access to these two attractions and much more, including a number of acclaimed restaurants, beach shops, galleries, boutiques, and fun off-the-beach activities. For a vacation that encompasses the best of Hatteras Island and the Outer Banks, plan a stay in the shadow of the lighthouse with a weekly rental at one of Buxton's many fine vacation homes. With great beaches, fun activities, and plenty of fantastic sight-seeing both on the ground level and from the towering balcony that encircles the lighthouse, Buxton has it all. Buxton is an interesting beach town, located in the heart of Hatteras Island at the direct "point" where the island hooks west and starts to face the Atlantic Ocean at a southeast angle, instead of strictly east. It's also home to one of the largest parcels of maritime forest, the wild Buxton Woods, and as a result, Buxton varies greatly in both width and landscape. In the southern portion of the island, where the majority if not all of the oceanside vacation rentals are located, the island is rather narrow, with thin beaches that are protected by a small line of sea-oat lined sand dunes. As a visitor travels south, the island grows wider and wider until the beach is located miles away from the main road that drifts through Buxton, NC Highway 12, and therefore the shoreline can only be reached after a long and wild trek through the Buxton Woods. That said, the ocean beaches in Buxton are among some of the most famous on the Outer Banks, and even visitors staying along the soundside or in the secluded wooded regions will enjoy 5 minute drives to some of the most popular shorelines on Hatteras Island. The Old Lighthouse Beach, located naturally close to the original lighthouse's location, is a famous spot for surfers and skimboarders, while the Point, a 4WD accessible only beach, is located just past the lighthouse via a beach ramp that winds all the way to the geographical "turning point" of Hatteras Island. This beach is a Mecca for surf fishermen as the shifting currents and proximity to both the Labrador Current and the Gulf Stream Current makes it prime fishing grounds for large and alluring species, including drum, mackerel, flounder, bluefish, and much more. The Cape Hatteras Lighthouse is located in between these two beaches, and is easily the most recognized lighthouse in the country. With its distinctive black and white candy cane stripes and towering exterior, (it is the tallest brick lighthouse in the world), the lighthouse is easily Hatteras Island's most visited attraction. The National Park Service grounds that are home to the lighthouse also feature a small turtle pond, a picnic area, and a .75 mile walking trail that leads through a patch of the scenic Buxton Woods. This trail is wide open for the public to explore, just be sure to bring bug spray in the summertime. Off the beach, Buxton has one of the largest collections of restaurants out of all the villages on Hatteras Island. These restaurants range from casual raw bars to soundfront fine dining establishments, with everything in between. Visitors will find pizza joints, funky sandwich shops, family style seafood restaurants and eclectic restaurants with unique takes on standard seafood fare. For entertainment, Buxton guests can stroll over to the local ice cream shop and putt-putt course, have fun at the video arcade, or head over the local sports bar for a few rounds of billiards. As for services and shopping, Buxton features a medical practice, several renowned tackle shops, mechanics, gas stations and convenience stores, and a fantastic locally run grocery store that features all the essentials and a great deli for easy picnic lunches. Buxton visitors will also find several small shopping centers, the island's only ABC or liquor store, several boutiques and galleries, and the island's book store which features local favorites and newly published best sellers. Nature lovers will want to take a trip to the sprawling Buxton Woods, and virtually any oceanside road from the lighthouse to the borders of Frisco will offer ample trails to explore. These trails are generally unmarked and completely wild, with limited facilities posted along the way, so explorers are urged to bring along a compass or GPS, plenty of water and bug spray, and all the supplies needed for a full afternoon of rustic exploring. A good place to start hiking is a wide trail located just ¼ mile past the lighthouse, or along the small dirt road that leads out to the Buxton Water Tower. Virtually any side road can be a Buxton Woods outlet, however, and explorers will be rewarded with dense woods, marshy creeks and ponds, and huge sand dunes covered in sea oats that would be better suited next to an ocean. Buxton's northern borders continue into Frisco and additional regions of maritime forest, while its southern borders lead out to empty expanses of beaches, and windsurfing and kiteboarding retreats Kite Point and Canadian Hole beaches, before finally connecting with Avon 7 miles away. Basically, Buxton may not have a wide selection of diversions like its northern neighbors in Kill Devil Hills and Nags Head, but it does have ample entertainment options to keep vacationers entertained on the occasional rainy day. With plenty of locales for nature lovers, lighthouse buffs, watersports fans, and shoppers and diners, Buxton features a nice sample of the best of the Outer Banks. For accommodations, Buxton is essentially comprised of hotels and motels, two acclaimed bed and breakfasts, and vacation rental homes. There are no major condo complexes in Buxton, and no major resorts, although there are a handful of privately run small campgrounds ideal for RVs. The rental homes in Buxton vary greatly on location, size and grandeur. On the southern section of town, Buxton features a handful of oceanside and oceanview communities that offer easy walking-distance access to the oceanfront. These homes range from small 2-3 bedroom cottages and even duplexes to 8-10 bedroom beach retreats. The smaller cottages generally boast nice wide porches, cozy bedrooms, and ample space for small families to relax and catch a good night's sleep in between beach trips. The larger homes may feature game rooms, dens, lofts, and even private pools in addition to the exceptional beach access. 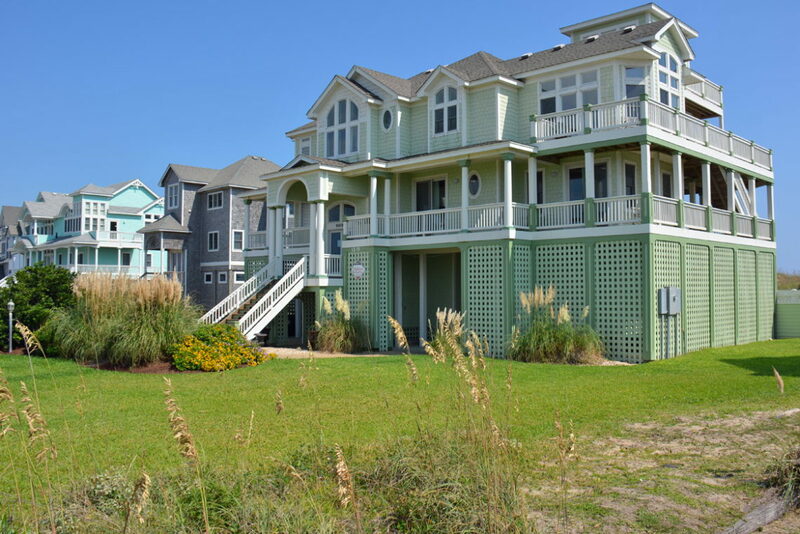 All of these properties feature easy access on foot to both Buxton's beaches and a number of tackle stores, restaurants, and convenience stores located along NC Highway 12, making them terribly convenient for vacationers who just want to stroll around and check out the lay of the land. Buxton vacationers also have the option to stay at soundside and soundfront vacation rental homes, and these properties are known for both their seclusion and their grand amenities. These properties are often overlooking wide portions of the Pamlico Sound and are shaded by towering live oaks, cedar trees, and bald cypress, making them secluded retreats for weary travelers in need of a little peace and quiet. Many of these homes feature the best of the best amenities, including boat docks, private pools, waterfront hot tubs, game rooms, and even theater rooms and sprawling great rooms overlooking the sound. For luxury rentals that also capture the wild serene landscape that the southern Outer Banks is known for, these properties are a sure thing. From the ocean to the sound, Buxton vacationers can accommodate everyone from the salty group of fishermen itching to get to the Point to the elite vacationer who craves a quiet retreat with all the comforts of a modern resort. With a little searching, Buxton visitors will surely find everything they are looking for and more, thanks to the diversity and accommodating nature of Buxton's vacation rentals. For fans of Hatteras Island, one of the biggest benefits of a Buxton vacation rental is sheer convenience. In Buxton, a visitor can easily head to a local grocery store, acclaimed tackle shop or favorite restaurant within minutes, as well as the famous Cape Hatteras Lighthouse and neighboring Point and South Beach shorelines. Buxton has always been a popular retreat for surf fishermen, although over the past decades, surfers, kiteboarders and windsurfers have flocked to the region as well for its proximity to famous sport-specific beaches, including the Old Lighthouse Beach for surfers, and Kite Point and Canadian Hole for sound-based sport lovers. Buxton also has a unique and almost residential feel that allows visitors to sink into the local Hatteras Island culture. The majority of Hatteras Island's year-round residents live in Buxton and vacationers will find plenty of local southern hospitality at the local tackle shops, grocery stores, and other Buxton landmarks. As for vacation rentals, Buxton vacationers will find they can be as casual or as elegant as they'd like, with rentals spanning the spectrum from quiet oceanside retreats to sprawling secluded soundfront complexes. For family fun on the beach or relaxing evenings by the sound, Buxton truly has guests of every taste and style well covered. Because Buxton is located in the heart of Hatteras Island, it is a good hour drive from Whalebone Junction and almost an hour and a half from the Wright Memorial Bridge, the two main entry points to the Outer Banks. Soundside vacationers will also have to drive to the local beach access, as the deeper you get into Buxton, the further you get from the shoreline, which is protected by miles of rich and dense maritime forest. Luckily there are several public parking areas, located by the lighthouse and also on the northern outskirts of town, as well as several beach driving ramps in both Buxton and Frisco allowing visitors with 4WD vehicles to simply drive out to the beach with all their gear in tow for a great day on the sand. Vacationers should note that in recent years some of the region's most popular 4WD beaches have had seasonal closures due to bird nesting seasons, and access to the Point or other 4WD beaches may be limited in the prime summer months. In addition, a beach driving permit is required to access the 4WD beaches, however the permit can be easily picked up at the National Park Service station located adjacent to the Cape Hatteras Lighthouse. Visitors will have to pay a weekly or annual fee, and will have to watch a ten minute video about beach driving in order to obtain their permit. Finally, visitors who need a world of activities to stay entertained may not appreciate the quiet scene in Buxton. There are no chain stores or amenities, and while the area does feature a sample of everything a vacationer might need for a rainy day, there aren't endless options like in Kill Devil Hills or Nags Head. Really, Buxton is an ideal retreat for visitors who want to relax, unwind, and enjoy quiet days on the beach exploring the variety of sports, (like fishing, surfing or kiteboarding), that have put the Outer Banks and Hatteras Island specifically on the map for water lovers. Visitors who want to check out the fantastic fishing scene should plan a visit in the spring or fall shoulder season months. During these times, not only are the majority of beaches and beach ramps open, but the fishing is simply incredible thanks in no small part to the number of migrating species that flock to the Outer Banks. Red drum are an especially popular target, and the Hatteras Island area has a number of fishing tournaments dedicated to this prized species. Fishermen who head to the Buxton beaches during the famed semi-annual "drum runs" are often rewarded with incredible drum catches that can reach up to 50 lbs. If you're vacationing in Buxton, be sure and check out the local shopping and dining scene. The local grocery store is a Hatteras Island icon, having been in business for well over 50 years, and the local book store is also a treasure, and housed in a historical Hatteras village home that was relocated to Buxton and converted into a small, charming shop. The restaurants in this area are also plentiful and can accommodate all tastes, from budget-friendly fried seafood feasts to romantic soundfront 4 course meals. In Buxton, heading off the beach and exploring the scene is part of the fun, and vacationers should take advantage of their unique, eclectic and tasty surroundings. Nature lovers should definitely head to Buxton in the shoulder and off-season months. The winter is prime shelling season, as the beaches south of Cape Point are open to visitors, and often offer incredible finds that are unparalleled on the Outer Banks. Treasures can include helmet conchs, whelks, scotch bonnets and more, although these beaches are generally only open and accessible in the dead of winter. Hikers will also want to take an in-depth exploration of the woods in the off-season, when the temperatures are moderate, the bug population is non-existent, and the wildlife spotting is at its best. Keep your eyes peeled for deer, otters, nutrias, and even alligators, which are rumored to lurk along the salty canals and creeks of Buxton Woods. Planning an island wedding or event? Buxton has a nice selection of soundfront vacation rentals that are perfect for romantic waterfront weddings. A couple of these estates are even designed with weddings in mind, with expansive gathering locales, indoor and outdoor living areas, and multiple kitchens and wet bars to make catering set-up a breeze. Ask your Hatteras Island property management company for recommendations on event-friendly homes. Often, the properties that allow weddings in Buxton can accommodate the largest number of guests, so visitors with a large destination wedding in mind should consider these Buxton vacation rentals for their big day. Buxton certainly has a lot to offer its potential vacationers. With both quiet and popular beaches, some of Hatteras Island's most famous landmarks and natural sites, and plenty of restaurants and shops to fill out the day, Buxton has plenty to keep every laid-back family entertained. Plan a getaway to one of the decadent soundfront estates for relaxing open views of the Pamlico Sound enjoyed in style, or book a beachside cottage for family fun and fishing on the seashore. With accommodations that can be suited for virtually every style and taste, Buxton is a great representation of all the wonder and charm that Hatteras Island has to offer. Consider a Buxton vacation rental for your next Outer Banks vacation, and enjoy the highlights of Hatteras Island's wild side.